It's actually false that witches prefer black. Trust us, we know a LOT of witches, and we've polled them all. It's just a stereotype that witches wear all black and put curses on people. Most modern witches we've met prefer deep jewel tones and use their magic to be a force of good in the world. And THAT is the kind of witch your little girl wants to be. Pretty and powerful and with a penchant for shining her light on others. Well, isn't it perfect, then, that we have this unique Girl's Sparkle Witch Costume handy, for a youthful and bright little witch such as yours? This is truly a one-of-a-kind costume, complete with an undeniable sparkle that will help your gal shine this Halloween. As a bonus, she'll be easy to spot around the neighborhood, especially in the sea of "traditional" witches that haven't yet heard: witches don't just wear black! This special costume comes styled as a dress with a velour bodice and layered skirt. The top layer is purple tulle with a printed black cat, bat, witch, and star pattern. This matches the puffed, transparent sleeves and collar. Beneath the purple is a layer of pumpkin-orange skirt that really pops! Twinkle lights are attached to this skirt layer, and have an attached battery pack that is carried in the waistline. A classic black cone hat defies tradition with its orange and purple accents. All in all, this is one look that looks as magical as it feels to wear! We're thrilled your gal is helping to dispel the myth of the witches in black. Maybe she can take it one step further, by spray painting her broom purple or getting an orange cat to follow her around! That oughta show 'em! 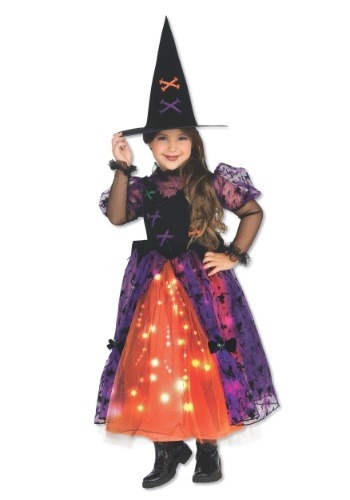 I ordered this witch costume because so adorable and mainly for the lights in the dress. The dress fits great and is what you expect for a Halloween costume but the fact the lights don’t work was really disappointing. I even spent anothe $10 on replacing the batteries thinking that would solve the problem but still no lights. My 3 year is pretty bummed but luckily a light up necklace made her smile! I purchased the necklace separately once the dress wasn’t working.